All marketing people have done it: turned a lead over to sales without really qualifying it. Marketing is often accused—and rightly so—of generating and/or providing poor quality leads to the sales team. Much of the recent past has been abuzz with the intrinsic promise of Marketing Automation and much of that is centered on lead nurturing. Though using a one-trick pony like email nurturing is often the fallback for Marketing Automation platforms, this narrow approach will leave your ROI flat and your sales team frustrated. Simply said, an over-reliance on email will not develop and deliver sales-ready leads. Stop smothering your customers with Email only Marketing Automation! It takes variety to implement a smart, strategic plan BUT it will give your ROI a big boost? Get in touch with the experts at ResponsePoint. We’d be happy to give you a free 15-minute phone consultation and answer any questions you may have. So how do you build a lead nurturing process that uses the right mix of restraint and intent? Identifying and understanding some of these common mistakes is key to the success of any marketing automation platform. Effective marketing automation implementation amplifies demand generation and increases the linkages between sales and marketing success. 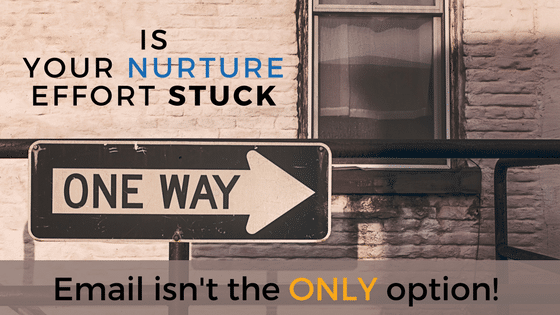 Think outside the email box for lead nurturing. Likewise, for this type of marketing to succeed, your lead nurturing efforts need to incorporate more touch points beyond a landing page form, and email follow-up. Lead nurturing is all about engaging your B2B leads with relevant content, while further qualifying your lead toward a SQL. It allows for top-of-mind engagement that accelerates the buyer journey. It also provides valuable insight into how you can solve their problem. Many inbound and outbound marketing efforts are developed around a particular focus and therefore incapable of delivering sales-ready qualified leads. Marketing must accept the new methods that discourage running multiple disjointed projects, programs, and channel approaches. The way to get things done is through a more focused campaign with true multi-touch nurturing efforts. These efforts need to include some human elements such as tele-prospecting to improve qualifying and match target attributes to prospects identified. A common theme we see from companies needing assistance is an over-reliance on one particular channel to drive leads. Mostly it is centered on the marketing automation campaigns that are email-centric. Sirius Decisions reports that the average sales cycle has increased 22% in the last five years. Much of this is attributed to more decision makers being involved in the sales process. Any campaign or programs that are developed to turn leads over to sales immediately after first interaction will fail without proper lead nurturing. Automation only approaches will work in the short term but does not sustain over the long haul. Lead nurturing is essential for industries with longer buying cycles. As such, B2B companies should be making consistent contact with the prospect at all stages of the buying journey—and not exclusively through email. Marketing’s method for MA success should be focusing on the entire lead nurturing effort to more fully qualify leads before passing any to sales. If an email marketing automation campaign triggers automated sales steps, it’s probable that sales are going to ignore them. Scoring through electronic conditions and means it is not the same as a human SDR trained in lead nurturing, lead qualifying, and talking with the lead. While marketing automation reliance on email may reduce your costs, reliance on it as your only method for nurturing is going to leave your overall results flat. Sure, you can create leads but creating leads is not the same as creating an actionable pipeline. So, while the lead sales cycle might be lengthening your effort to reach them through a nurturing effort, which is supported with alternate touches and interaction beyond email alone. Lead nurturing is a continuous process of improvement. It requires a commitment from marketing and sales to align their process and efforts in order to get the best results, insights, and quality of leads.